Indeed, Dave Matthews Band is still unstoppable! They are wildly packing-in arenas and fans can't get enough of those 'to-die-for' tickets. You can either brave the massive crowds the last minute and feel stressed out, or score those tickets now and elatedly be secured of your spot on the most-awaited concert of the year! You've seen it once, you've seen it all — such is definitely NOT the case for Dave Matthew's Band's concerts. A DMB concert is literally one of a kind. It is a widely known fact that Dave Matthews Band is a master of improvisation. The band never plays the same song the same way. Each rendition is different. Each performance offers something new, something fresh. 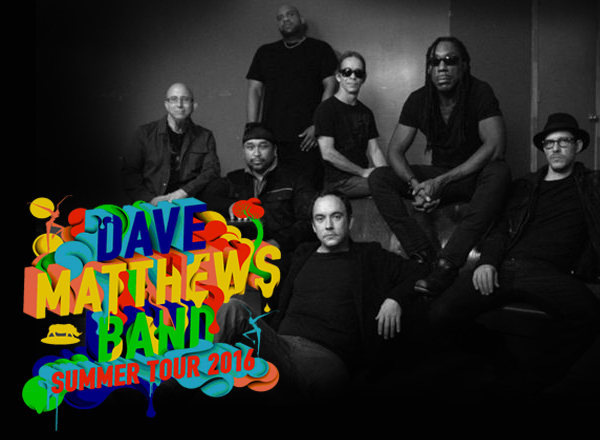 Dave Matthews Band was formed in 1991, and is composed of singer-songwriter and guitarist Dave Matthews, bassist Stefan Lessard, drummer/backing vocalist Carter Beauford and saxophonist LeRoi Moore. The band lost their saxophonist, Moore, due to an unexpected death in 2008. Filling-in on his spot was Grammy Award-winner Jeff Coffin (of BÈla Fleck and the Flecktones). Over the years, additional members were added to the line-up: Boyd Tinsley ñ violin, vocals, mandolin, flute; Tim Reynolds ñ electric guitar and Rashawn Ross ñ trumpet, backing vocals.